I met Allie going on 10 years ago, this Fall. (We're getting old!) She was a Sophomore looking to join our sorority Tri Sigma. That semester, our sorority recruited a very large group of girls, so some sisters had to take on additional littles. My big Amanda was one of them, and Allie ended joined our family tree. Fast forward to this past winter, Allie reached out to me shortly after her and Louis got engaged to see if I could capture their big day this upcoming December, which of course I said YESS! 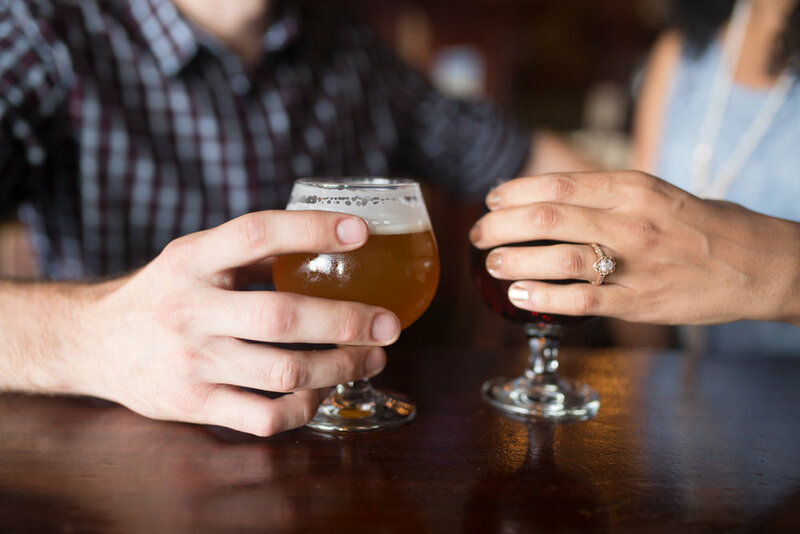 Now for their engagement session, they had a vison early on that they wanted part of it to take place at a brewery or bar, which I was completely down for. I also feel, it gives my couples a chance to relax, but also gives us an opportunity to chat before we get started and talk wedding to see if anything has changed since we first met to discuss the details of their big day. From there I just let them enjoy their beverages, and started shooting. Hope you enjoy!